For decades, the sewage treatment industry has been pushing biosolids (the dewatered output of their work) as an agricultural soil amendment. It sounds like a great idea on the surface: what could be a more natural fertilizer than feces? Some of you might remember the classic 2002 book, Toxic Sludge is Good For You: Lies, Damn Lies and the Public Relations Industry. The reality, though, is that a lot more than bodily waste goes down the toilet. Folks—not just panicked drug dealers during a police raid—dump all sorts of highly poisonous stuff down the toilet, such as toilet and drain cleaners. And, except for those organic folks who eschew Western medicine—the caca of most folks these days is loaded with toxic pharmaceuticals. Biosolids are derived from wastewater treatment, mainly a mix of water and organic materials that are a by-product of the sewage treatment processes. The treatment process to produce biosolids stabilises them by reducing organic matter and micro-organisms. Stockpiled biosolids normally contain between 50 to 90% solids and visually resembles soil. In 2017 Australia produced about 327,000 dry tons of biosolids. Readers of REVITALIZATION know that the folks who are busy renovating our buildings and rebuilding our infrastructure are always looking for more-sustainable—and preferably cheaper—building materials. Toxic sludge to the rescue! How can you recycle the world’s stockpiles of treated sewage sludge and boost sustainability in the construction industry, all at the same time? Turn those biosolids into bricks. The idea is almost identical to the way Tom Darden turned contaminated soil from brownfields sites into bricks, as documented in Storm Cunningham‘s 2008 book, Rewealth (McGraw-Hill). A team at RMIT University in Melbourne, Australia, has demonstrated that fired-clay bricks incorporating biosolids could be a sustainable solution for both the wastewater treatment and brickmaking industries. The EU produces over 9 million tons of biosolids a year, while the United States produces about 7.1 million tons. In Australia, 327,000 tons of biosolids are produced annually. The study found there was a significant opportunity to create a new beneficial reuse market: bricks. About 5 million tons of the biosolids produced in Australia, New Zealand, the EU, US and Canada currently go to landfill or stockpiles each year. Using a minimum 15% biosolids content in 15% of bricks produced could use up this 5 million tons. Lead investigator Associate Professor Abbas Mohajerani said the research sought to tackle two environmental issues – the stockpiles of biosolids and the excavation of soil required for brick production. 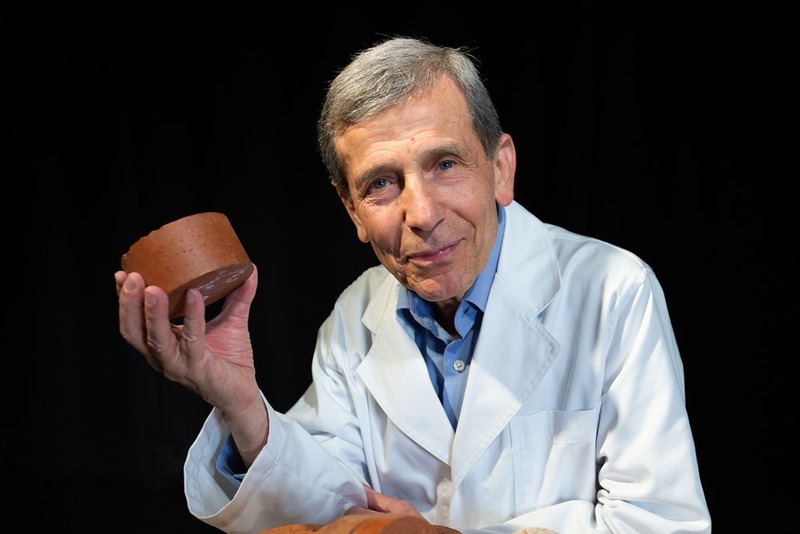 “More than 3 billion cubic metres of clay soil is dug up each year for the global brickmaking industry, to produce about 1.5 trillion bricks,” Mohajerani, a civil engineer in RMIT’s School of Engineering, said. “Using biosolids in bricks could be the solution to these big environmental challenges. It’s a practical and sustainable proposal for recycling the biosolids currently stockpiled or going to landfill around the globe,” he added. The biosolids bricks are more porous than standard bricks, giving them lower thermal conductivity. The research also showed brick firing energy demand was cut by up to 48.6% for bricks incorporating 25% biosolids. This is due to the organic content of the biosolids and could considerably reduce the carbon footprint of brick manufacturing companies. All photos courtesy of RMIT University.